Upstate Cancer Center is the first in the region to offer the TrueBeam System: a multi-modality, state of the art linear accelerator offering the widest assortment of individualized therapies. Cancer treatments are changing. 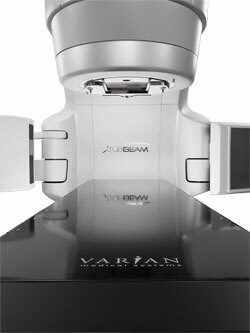 The TrueBeam system from Varian Medical Systems is an advanced radiotherapy technology for treating cancer. Opening up treatment options for people with cancer, it targets tumors with accuracy measured in millimeters. With its power and flexibility, physicians can develop treatments that are best suited for patients' individual circumstances. Many different types of cancers are now being treated using radiotherapy procedures. The TrueBeam system from Varian Medical Systems expands radiotherapy treatment options for even the most challenging cases, such as cancers in the head and neck, lung, liver, breast and abdomen. It offers many different types of advanced treatment techniques including stereotactic body radiation therapy (SBRT), image-guided radiotherapy (IGRT), intensity-modulated radiotherapy (IMRT), RapidArc® radiotherapy technology and Gated RapidArc. RapidArc is a form of volumetric modulated arc therapy (VMAT) that delivers a precisely sculpted 3D dose distribution with a single 360-degree rotation of the linear accelerator gantry. RapidArc involves varying (or modulating) the intensity of the radiation (in this case, high-energy X-rays). Image guidance improves tumor targeting, and IMRT shapes the radiation dose so that it conforms closely to the three-dimensional shape of the tumor. This means more dose to the tumor, and less to surrounding healthy tissue. For lung and other tumors subject to respiratory motion, TrueBeam offers Gated RapidArc radiotherapy, which makes it possible to monitor the patient's breathing and compensate for movement of the tumor while the dose is being delivered in a continuous rotation of the treatment machine. Gated RapidArc radiotherapy makes it possible to monitor patient breathing and compensate for tumor motion while quickly delivering dose during a continuous rotation around the patient. This development enables the use of RapidArc to target lung tumors with greater precision by "gating" the beam (turning it on and off) in response to tumor motion. With Gated RapidArc, it is possible to deliver highly targeted treatments to many types of tumors, including lung tumors that are moving, in less time than would otherwise be required. Gated RapidArc combined with High Intensity Mode delivery at 2400MU/min can deliver a full, 20Gy lung SBRT fraction in 7 minutes. This efficiency is significant for patients with comprised respiratory function or those who have difficulty maintaining treatment position during conventional radiation treatments. In terms of imaging, TrueBeam generates high-quality 3-D cone-beam CT images 60% faster than was possible with earlier generations of Varian imaging technology. Additional functionality makes it possible to create images using 25% less X-ray dose. An accessory called a multileaf collimator (or MLC) is what shapes the beam. It has 120 computer-controlled "leaves" or "fingers" that create apertures of different shapes and sizes. The leaves sculpt the beam to match the 3-D shape of the tumor. These can move and change during treatment to target the tumor and minimize dose to the surrounding healthy tissue. TrueBeam's additional functionality provides for the acquisition of a cone-beam CT, a form of CT, using 25% less X-ray dose than compared with earlier Varian image-guided technologies. This means patients can be exposed to less X-rays/radiation. The system includes a new "gated" option for synchronizing beam delivery with respiration. This helps maintain accuracy as the system changes its targeting whenever tumor motion is an issue, for example during lung cancer treatments. TrueBeam can be used for many forms of advanced treatment techniques including stereotactic body radiation therapy (SBRT), image-guided radiotherapy (IGRT), intensity-modulated radiotherapy (IMRT) and RapidArcÂ® radiotherapy technology.